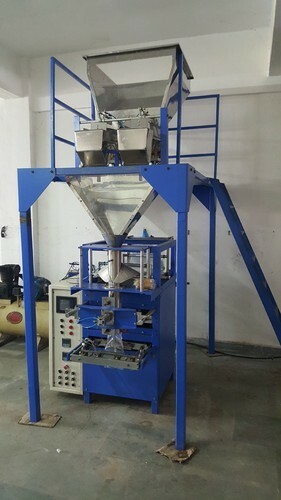 WAFER NAM-KEEN POUCH PACKING MACHINE - Machine is vertical filling machine for chips , Namkeen , kurkure , chess bolls , tea, free flow powder, biscuit sugar, pulses, grains, kashu ,badam pack sunflower seeds, peanut, granules etc , dal ,wafers, namkeen and dray fruits in pouches pack roll. Fully automatic filling sealing and pouch making in one machine . Filler weighs the filling material in individual pan mounted on the load cell to get maximum output and accuracy.